Why wouldn't one of the leading manufacturers of massage table and accessories have an equally lovable massage oil? 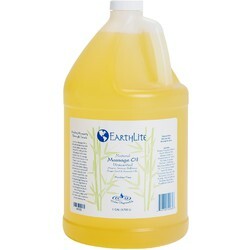 Earthlite's Massage Oil is a lovely mixture of sunflower, grapeseed and sweet almond oil along with vitamins A, E and C to repair, nourish and moisturize the skin.What also sets this oil apart, it is water dispersible, meaning it washes off easily! Also of note, this was voted the Professionals Choice Awards 2018 in the Body & Favorite New Launch category in Day Spa magazine. Take a look here. Tired of stained sheets? May be time to give this a try!